Today's news that two antiquities had been handed over to the Italian authorities is a reminder of the continuing issue of toxic antiquities. The Corinthian krater had apparently been handled by Giacomo Medici and had then surfaced on the market in 1985 through Sotheby's in London ("ICE returns stolen artifacts to Italy", ICE December 2, 2009). 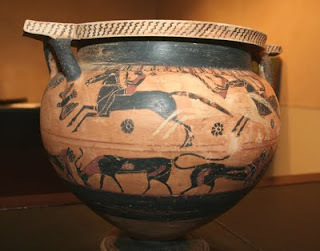 It is significant that an Attic bell-krater that had surfaced at Sotheby's in 1985 had to be withdrawn from a sale at Bonham's in London in October 2008. Two other pieces that have been returned to Italy had passed through Sotheby's in 1985. An Attic black-figured neck-amphora was returned from the Royal Athena Galleries, and an Attic black-figured amphora of Panatheniac shape had formed part of the collection of Shelby White and the late Leon Levy.